OWYHEE COUNTY, IDAHO — Killian Gonzalez hung on to life after one of the most traumatic injuries a child can sustain, with less than one percent chance of surviving. “He’s a miracle, he’s literally just a miracle child,” his mother, Brandy Gonzalez, told KTVB. 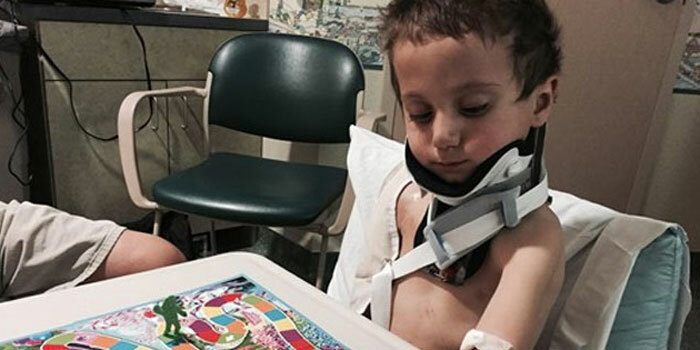 Four-year-old Killian is beating all odds after a nearly fatal car accident, where doctors told his mom he was clinically decapitated. About three weeks later, he’s not only alive and well, but he’s doing everything on his own. Killian was released from St. Luke’s Children’s Hospital after about two weeks — with a neurosurgeon deciding the little boy didn’t need surgery. The doctor put him in a hard neck brace — letting his injuries heal on their own. But that fateful day on May 22 was a mother’s worst nightmare. KTVB talked with his Brandy Gonzalez, as well as the woman who saved Killian’s life. “I see this car coming and I’m just praying that he’s going to slow down,” Gonzalez said. The two were headed back to Nevada on Idaho State Highway 51 near Bruneau after celebrating Killian’s fourth birthday. It was hailing that night and the roads were slick. “It was just so fast, I look back at Killian to see if there’s anything I can do – like if there’s a blanket I can throw over him. There’s just nothing… and then we hit,” Gonzalez told KTVB. She immediately knew she needed to help and attend to him, but when she looked back again, he was hunched over the side of his booster seat, not moving initially. Minutes later, people came rushing to help the family. Boise resident Leah Kaupanger-Woodward was one of those Good Samaritans — the mom of a little boy close to Killian’s age. She and her family were driving along Highway 51 on their way back from camping. “We hear Killian, the little boy Killian, screaming,” Kaupanger-Woodward said. “He was really lifeless,” Kaupanger-Woodward added. Joel busted the back window of the car and told his wife to hold the little boy’s head in place. They later found out Killian was internally decapitated. Doctors told Gonzalez that four of the six ligaments connecting his skull to his spine were stretched and damaged. Then, his head settled back in place. Gonzalez says Killian also suffered bleeding in his brain, a ruptured spleen and a broken arm and ribs. When first responders got to the scene they immediately life-flighted Killian, then transported him to Saint Luke’s in Boise. Brandy and her son were separated in different hospitals for almost two weeks, which she says was extremely hard on her. “It’s a miracle. It has to be,” Kaupanger-Woodward added. Brandy did say Killian was properly strapped in to his booster seat. Woodward tells KTVB she has a strong connection with them now and talks to Brandy almost every day. A GoFundMe has been set up to help with the family’s recovery expenses like hospital bills and physical therapy.